Women: 7% of single females aged 20–35 and 4% of previously married females aged 20–35 were given a rating of 3 for this period of their lives. 2 to 6% of females, aged 20–35, were given a rating of 5 and 1 to 3% of unmarried females aged 20–35 were rated as 6. "Males do not represent two discrete populations, heterosexual and homosexual. The world is not to be divided into sheep and goats. It is a fundamental of taxonomy that nature rarely deals with discrete categories... The living world is a continuum in each and every one of its aspects." (p 639). - Kinsey, et al. (1948). 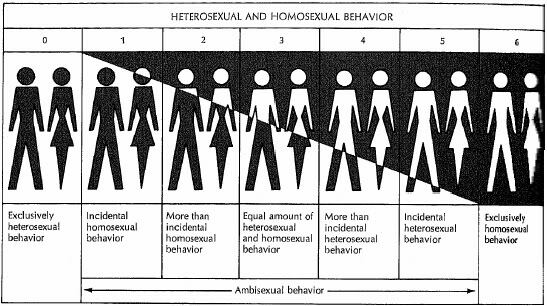 Sexual Behavior in the Human Male.